So yesterday I finished up a painting inspired by my friend, Mark. 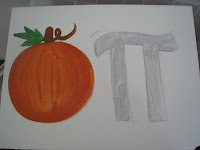 He and I have a love...a passionate love for pumpkins...and all things pumpkin. 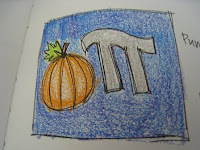 He has a very special admiration for pumpkin pie. I will ingest just about anything pumpkin...pumpkin bread, muffins, bagels, lattes,beer, soup, smoothies...well you get the picture. one up because that will be unveiled on Friday. The other excitement of the week...is that I've reached 50 followers! Hoorah! Thank you for following along and joining me in the day to day inspirations that fill my sketch books and eventually make it to the canvas. So...tomorrow I'll put final touches on things. There should be some changes made to the main website, www.ceciliadubon.com and Wednesday I'm delivering the paintings to Books and Books. The summer is officially over! 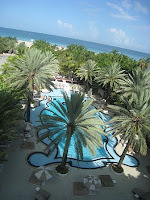 This weekend to mark the end of the season (so to speak) D and I spent the weekend at the Raleigh Hotel on Miami Beach. We had an oceanfront room at this historic (and pet friendly) hotel on 18th and Collins. 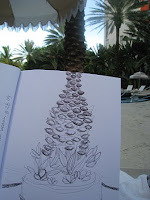 I spent the afternoon on Friday sketching poolside. 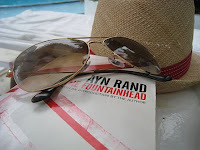 Then I spent the entire day on Saturday reading poolside. After a d ay of lounging some friends joined us for pool time and dinner on Lincoln Road. On the other side of town, one of my good friends, Katie went into labor with her baby girl...funny story (as is normal for her and her hubs)...he was on a plane to RI. when her water broke...so the day was fun and adventurous in many ways for all of us. Today I went to the hospital to meet baby Adria...but I won't put pictures of her here. I can't imagine having spent our last summer weekend in a better place with better people. Tomorrow is the beginning of a very busy week which will "end" on Friday night with the opening of my big show at Books and Books in Coral Gables. My first show in the Gables, I am beyon d excited! 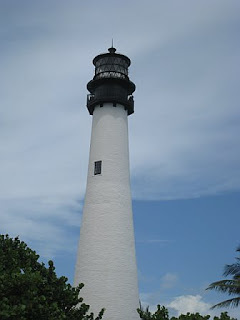 Monday I went up to the top of the Cape Florida Lighthouse for the second time. Regardl ess it's a gorgeous view! 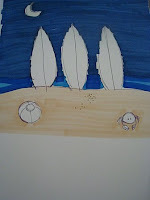 It got me thinking, perhaps I should paint the Lighthouse. 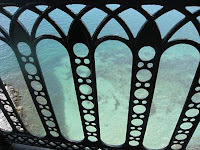 It is so pretty and bright next to the blue skies on Key Biscayne...and then the water is turquoise at its feet...rather breathtaking when you come to think of it. If you haven't been...I highly recommend it. If you go in the summer...bring OFF! Everyone comes into your life for a reason right? Well...some people come in your life and you wonder if genetic tests are needed to verify you weren't separated at birth. Derek is one of the people I may need to be tested with. Seriously....my brotha from anotha motha! Derek was in town for nearly a week and lucky me, he stayed with us for 3 days. Sometimes we just look at each other and the hysterical laughing begins. The crazy thing...is that when Derek told me he was coming in town in late August, it felt like forever...and now that it came and went...September is basically here...which means so is the show. HOORAH!!!!! another Bank Street friend wins the give-away!! 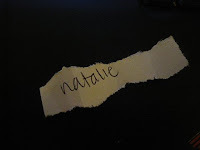 Crazy- but true with 24 entries, D picked Natalie Yoshino Ellis as our second winner. Congratulations Natalie! 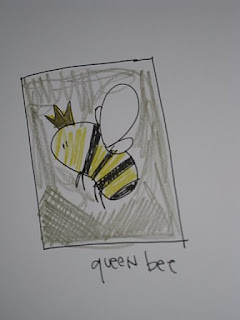 I'll work on the mini-queen bee for you and send it to your preferred address. Thank you to everyone for joining and commenting!! When we hit 50 followers we'll do another give-away!! When I was 17, I took my first Art History class at Gables High. Ms. Jean Greenaway was our teacher and with one flick of the light switch and the hum of the slide projector history began to be written. It was the first time ever, I got it. The first time I took a class, barely had to study and the A's came one after the other. For some it was math, languages, science...for me it was art. Scoring a 5 on the AP Art History test, I walked into SMU and my very first class was a 500 level Art History class with Professor Christpher Fulton (*swoon)...that one class paired with Ms. Greenaway's class quickly lead me to a major and in 2000 a degree and a career in museums. As I'm painting, I thought I might share some of my favorite pieces with you. I've been fortunate enough to have seen nearly all of these live & in living color at some point in my life (everything except for the Arlofini Wedding Portrait which is at the National Gallery in London). 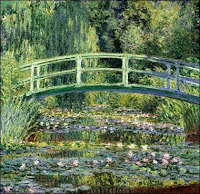 My ultimate favorite is, Le Bassin Aux Nympheas by Monet. 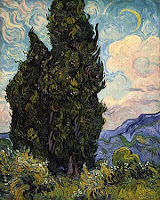 I first saw it in Paris---and I most recently saw it at the Met in New York. It may seem cliche to adore this piece as much as I do...but it reminds me of my grandmother. At the end of the day...art speaks to each of us in a different way. It is a visual and emotional language that we can all understand. You don't have to hold a degree in Art History to appreciate that. I just had lunch with a friend who has a keen eye for art galleries, their set ups...and being on a committee for the arts, he also knows what he's talking about. He was asking me about the show--and asking what was going to come back from my last show. I told him I wasn't planning on bringing anything...and he said, "You should bring back a couple of strong ones that haven't been seen in public in a while." So with that in mind....these are two of the pieces I am thinking of bringing back. "Rolling Hills" and "Redheaded Mermaid"
The nice thing about these is that they do thematically match up with some of my new pieces, such as "Double Banyan" and "Mermaid 3" . I may also bring back, "Key Lime Pie". So round and round we go---where we'll stop---nobody knows! 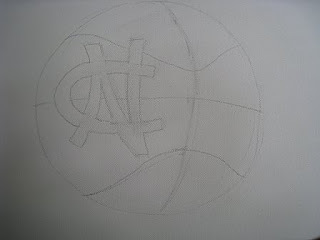 So...normally I use black marker to draw the outlines on my paintings. Well, not this time. This time I am taking the silver lining literally and experimented a bit. The idea for this came to me when I was on a plane headed to DC. Looking at the clouds, I thought about the light and ow it bounces off of them...the silver lining. 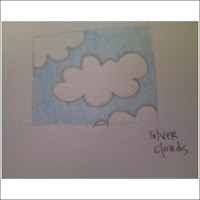 "hey...why don't I try a silver metallic pen on clouds?" I thought to myself. When I got back home to Miami--I sketched it, showed it to my art critic--and once approved I put it on canvas. 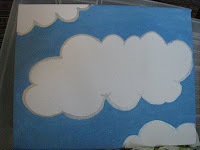 Little Puffy Clouds...live and in living color for you to see at Books and Books (Coral Gables) soon. 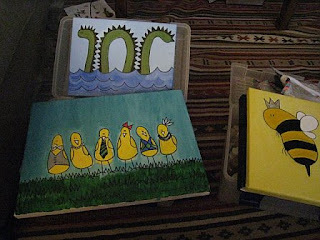 Last night I did some more work on paintings that I started on Sunday. Two of them were planned (Queen Bee & Los Pollitos Dicen Pio, Pio, Pio) and Nessie, which you may have read about earlier--was a spur of the moment painting...which I adore. After so many of you enjoyed the drawing of the Queen Bee yesterday, I thought that I would show you the painting. There are going to be about 20 paintings on display at Books and Books next month--- so I will be painting more throughout this week as I can...and do another batch on Saturday. There are some more trees to come...some other funny characters...and a couple of play on words-- in the style of last year's "Key Lime Pie". Hope you enjoy them. Ok-- so we did it! We reached 40 followers!! YAY!! This means that we are embarking on a free give away!! Monday August 17-Sunday August 23rd. Winner will get a mini-queen bee - bound to be one of this fall's new favorites! So I have been painting all weekend long (only taking breaks for meals and socializing occasionally). One of the paintings I finished was a spur of the moment topic. 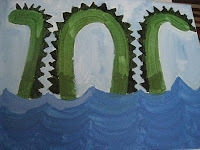 Nessie...you know...the Loch Ness Monster. 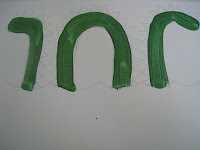 Now...I know that Nessie doesn't have the spikes traditionally...but to me she does. 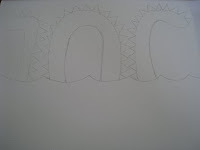 So here is the progress of Nessie. fit all in one canvas. Then I started painting her....one layer at a time she started to come together. I did finish her...but I've decided to keep her under wraps until she hangs on the wall at Books & Books in the Gables next month. 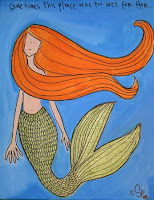 Along with Nessie, I painted another Mermaid...Double Banyons...5 Little Piggies and a request from earlier this summer which I blogged about, Los Pollitos Dicen-Pio,Pio,Pio. I hope you are enjoying the progress of my summer painting list. ...and I hope you will come out in September on Gallery Night in Coral Gables and see the paintings live and in living color. As usual...thanks for the support! I'll have 5 more paintings by the end of next weekend. 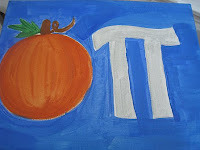 This year I am chairing the Junior Orange Bowl's Annual Auction. 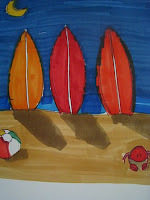 The theme for the auction is "Beach Blanket Bingo"...think the beach in the 1960's. The committee has been working really hard on gathering fantastic auction items and finding sponsors. It's going to be a fun night on the water at the Miami Rowing Club. One of the things I took upon myself was creating the artwork for the invitation. 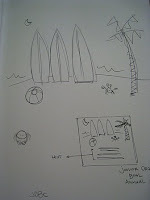 Here is how it all went down... first the sketches which I presented to the Auction Committee. Then I decided to use my art markers, which I rarely do-- What I thought would be the first go around of a sketch, turned out to be the actual drawing. So once it was done-- D scanned it and sent it through the cyber webs to the JOBC office who has now sent it to the printers. Invitations are being stuffed in a couple of weeks--- and I hope to see many of you there helping raise money for this 61 year old Miami organization which creates, inspires and mentors young people from around the world. This weekend was full of celebration with two baby showers. Saturday was my dear friend, Sarah's baby shower. 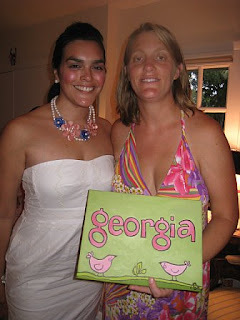 This is a picture of Sarah with a cSd original, a personalized painting for her baby to come, Georgia. Sarah doesn't have a middle name for Georgia, so I went with the full name, rather than just a "G". This is the first time I've never painted a full name like this, and I really like how it turned out. 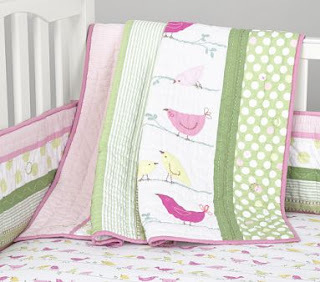 Knowing where Sarah is registered, I looked up her linens and themed out the scene to match her Pottery Barn Penelope pattern. Sarah and everyone else seemed to. So here you go...another happy mommy. 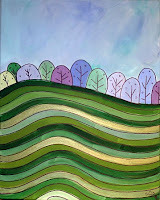 I have a few more nursery paintings I am working on now--they're so much fun to do. 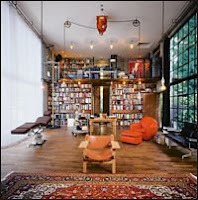 So I was thinking about what my dream studio/office would look like. First of all each wall would have a use-- one wall would most definitely have to be basically a huge window to let in all the natural light available. It'd be better if it was a hinged glass garage door of sorts that I could roll up and open the room up to the backyard or some sort of small garden- maybe with some seating. Another wall would have to be a bookshelf. I have so many books- and I am always picking something up -- I it would have to accommodate my books and have room for growth. This wall would have a ladder and also a system for movable framed art-- this is one wall I have dreamt of for a very long time! Another wall would have to be a magnetic chalkboard wall-- this would be the home to things like my famous "punch lists" and for all my other lists, like websites to visit and ideas for paintings would be sketched all over this wall. 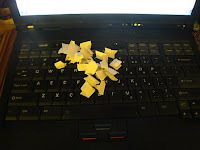 And lastly the fourth wall would have to be a cork board wall. This is something that I just recently added to my wish list--- but I have always had a happy wall in my office spaces at work. I'd love to have one at home. 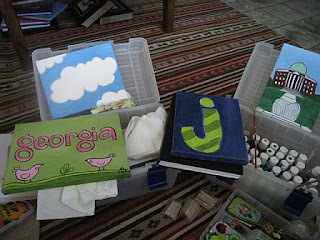 A place to put pictures, my buttons, postcards...mind maps...all sorts of great things! 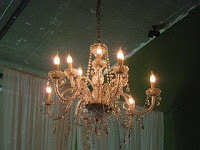 In this wonderful room of mine I would have a chandelier. Why? Well because I love chandeliers in unexpected places...offices, dressing rooms, bedrooms...so my light fixture would definitely be a chandelier. Furniture is easy! 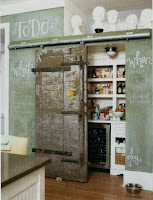 I'd love a barn door as my door. Then for a desk, one of my greatest friends in the world Jessica (Singleton in the Kitchen) has the most beautiful desk--its a solid pine door painted in red. I LOVE IT! It wouldn't be my office without music and TV though--- so a flat screen would maybe be mounted on my chalkboard wall---and I'd just have good speakers for my computer to pump my itunes library through. So the secret commission I was working on...got picked up tonight, so I can share what it looked like in the process of making and the finished product. My childhood friend Elisabeth is the eldest of three. 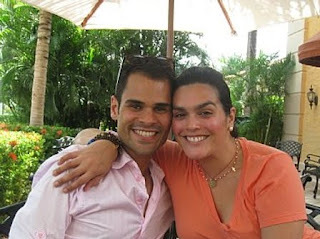 Her baby brother, Ben is not only not a baby anymore...but he is an engaged recent graduate of UNC Chapel Hill. Ben's adorable fiancee, Kate thought it would be fun to give him a special and unique graduation gift. THAT is where I came into the picture. 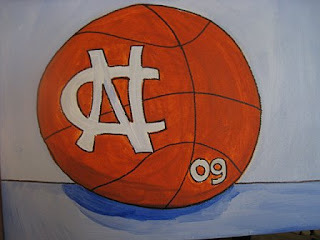 Ben not only loves UNC and Kate...but he also loves basket ball. 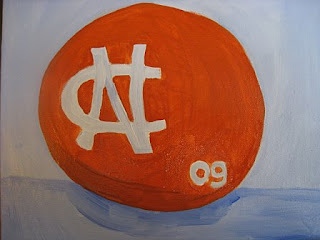 Thus...the UNC '09 basketball. As a big NCAA basketball fan, and a big fan of Ben and Kate's I am so happy that this will be a special painting for them that will hopefully be in their home as they married in the spring of 2010 and live happily ever after! I spent the majority of the day painting today. So here is a peak at what my day consisted of!